Welcome to my EpicNPC page. Since the beginning of 2015 i am an active user on EpicNPC, offering my services to thousands of individuals. One of my key developments was to take my business to a whole new level. Below a short introduction to my new business. 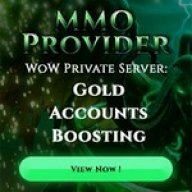 MMOprovider has become more and more dedicated over the past years in the gaming business that the time has come to offer you professional quality and service. Your safety & happiness is our biggest priority, that’s why MMOprovider is going to be there for you at any time. Our service is of high quality and the products have been verified with caution.